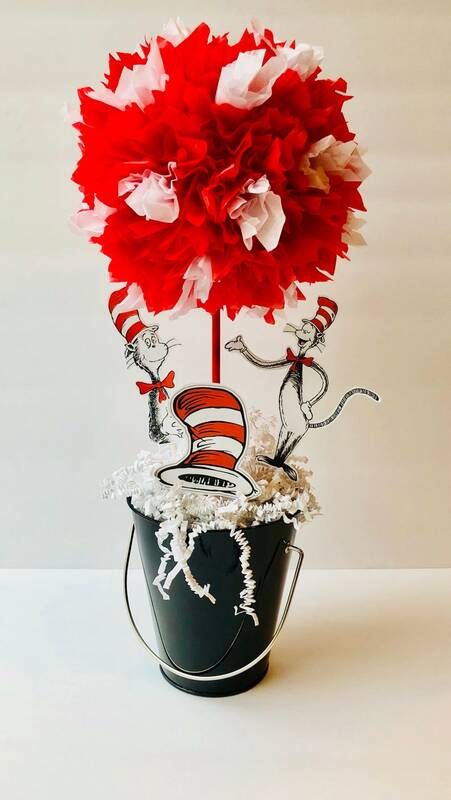 This Dr Seuss centerpiece decoration is the Perfect way to bring your Dr Seuss theme together for your birthday party or baby shower, featuring thing one and two and cat in the hat. You will get 1 dr Seuss topiary decoration centerpiece with base and cutouts on stick done in traditional Dr Seuss colors with the 3 Cutouts. This dr seuss centerpiece measures approx. 14" in height! The cutouts are approx 3-6” the tissue ball is 6” round and the bases are 4-5” high. If you need different colors or other colors added for tissue tops or Paul’s just let me know! Everything can be customized!